In older times, wars were as normal as sleeping. 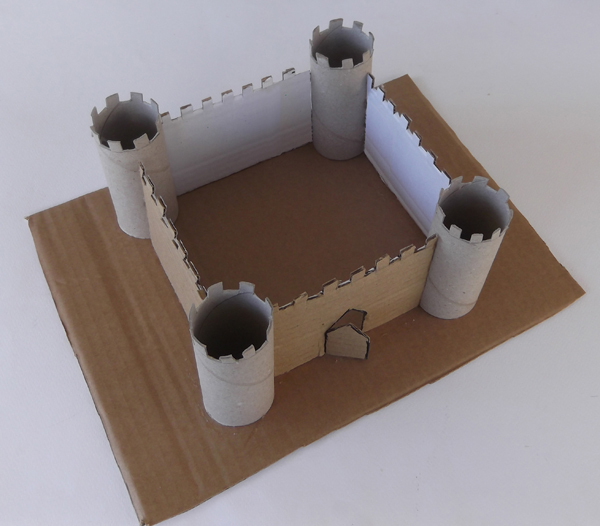 For this, castle builders added many defensive features to protect the castles from the enemies, like moats, tooth-shaped battlements, drawbridges, iron gates, etc. At least four empty toilet paper rolls. 1. 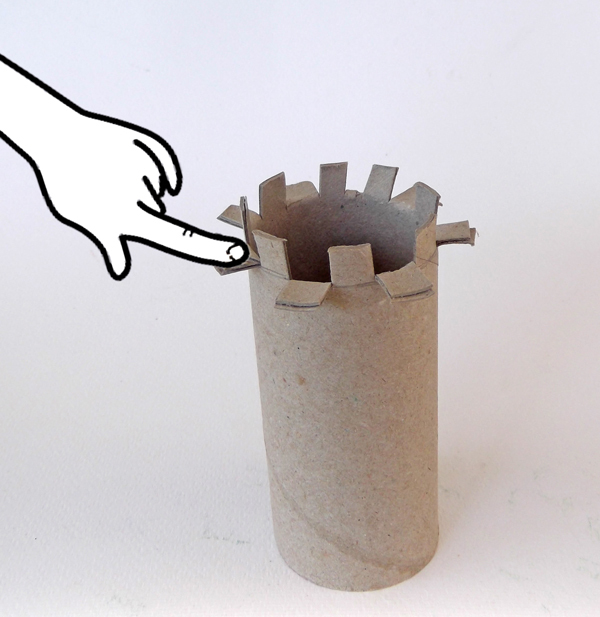 Start with the toilet paper roll. 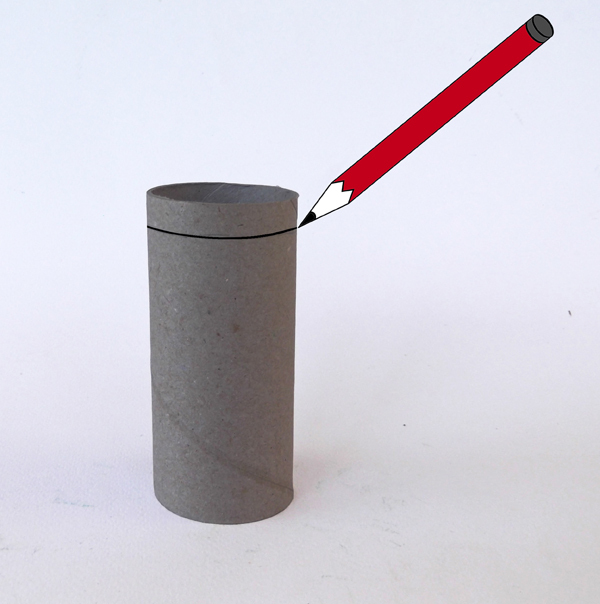 Draw with a pencil a line around the roll near the top edge, as shown in the image below. 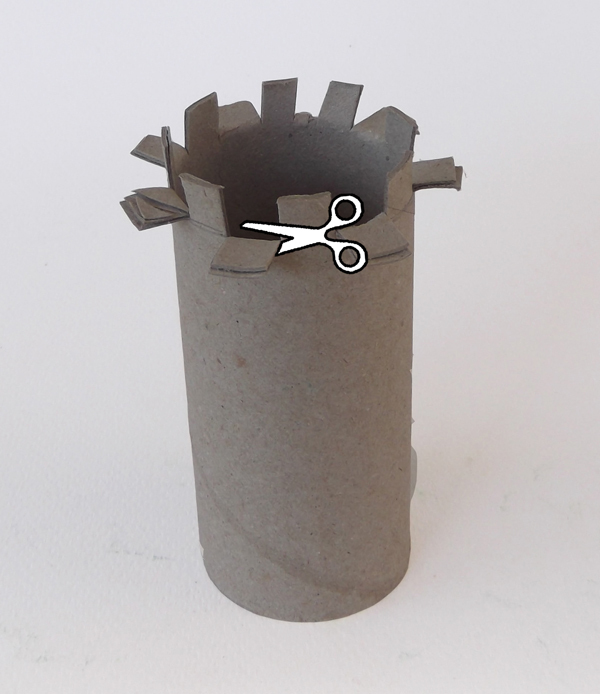 2) With the scissors make slits around the roll, from the edge to the guide line. 3) Open the flaps alternately out. 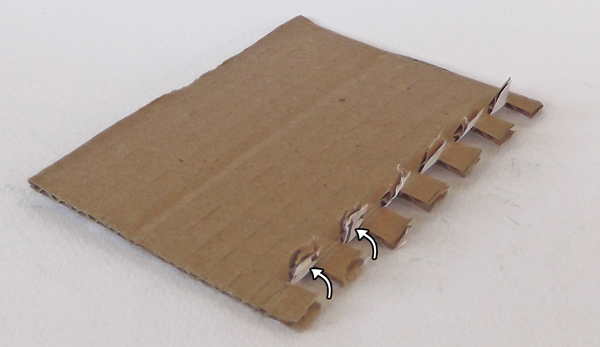 4) Cut the opened flaps with scissors. 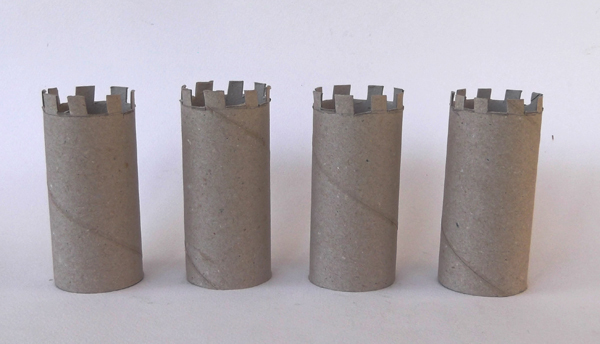 5) Make in total five round towers with battlements. 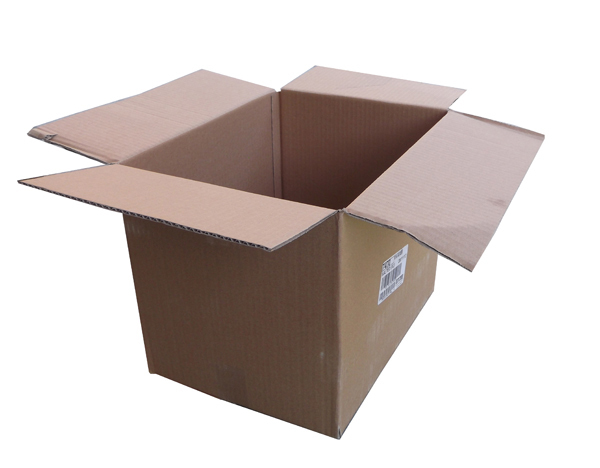 6) Find a recycled cardboard box. 7) Unfold it. 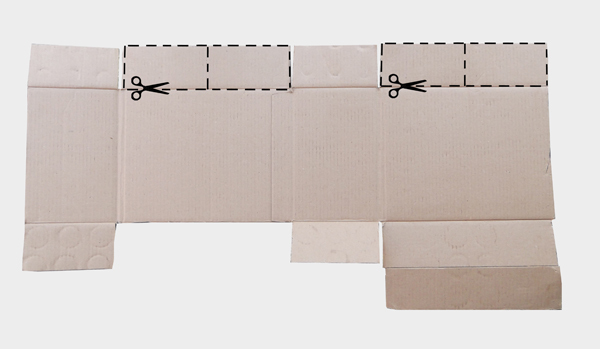 With scissors cut four rectangles as shown in the image below. 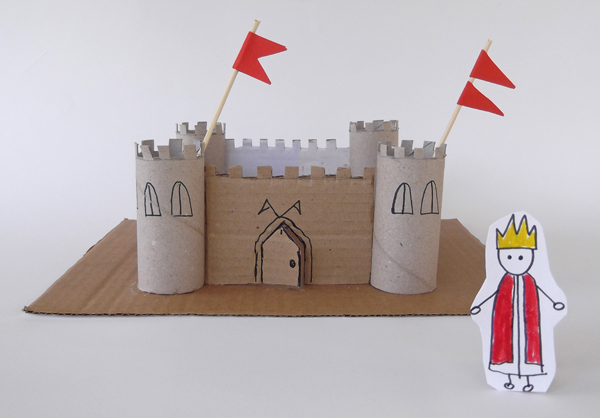 8) The height of the rectangles should be a little smaller than the height of the round towers. 9) Pick the first rectangle. 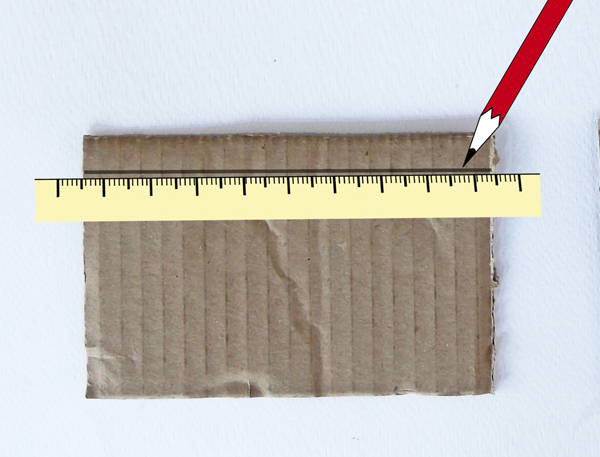 Draw with pencil and ruler a line parallel and near the longer edge. 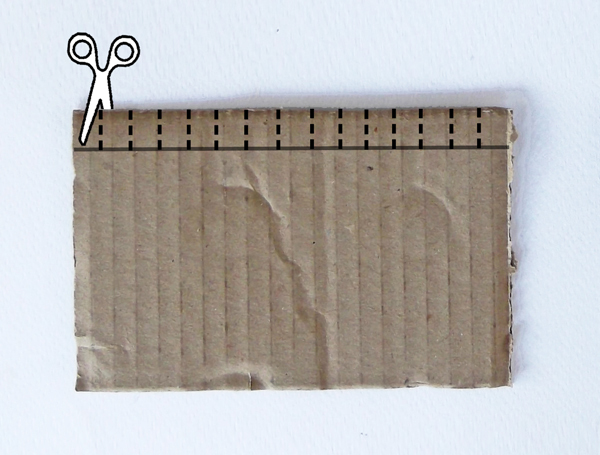 10) With scissors make slits from the edge to the line. 11) Lift the flaps alternately. 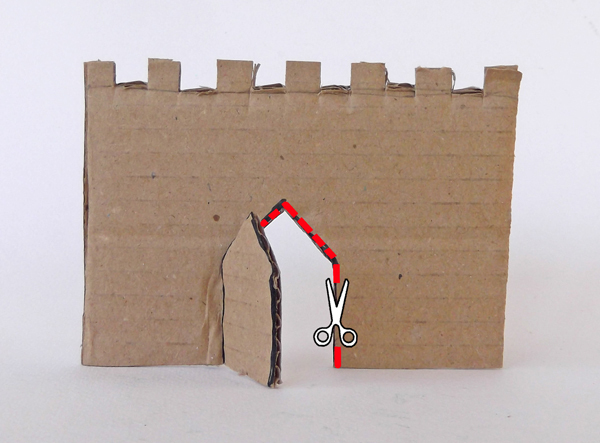 12) Cut with scissors the lifted flaps making the battlements. 12. 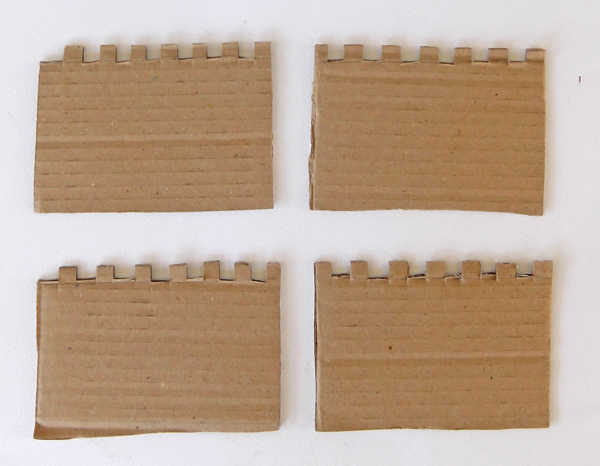 Make it total four wall with battlements. 13. 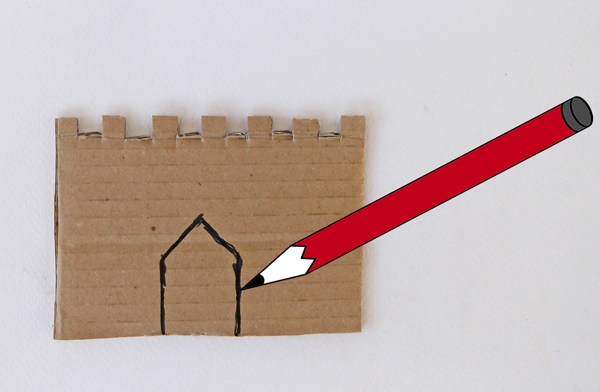 Pick one of the cardboard walls and draw in the middle a door. 14. Cut with scissors along the line. If you want one of the doors to be operable, do not cut along one of the side edges. 15. Glue one of the round towers with the wall. 16. 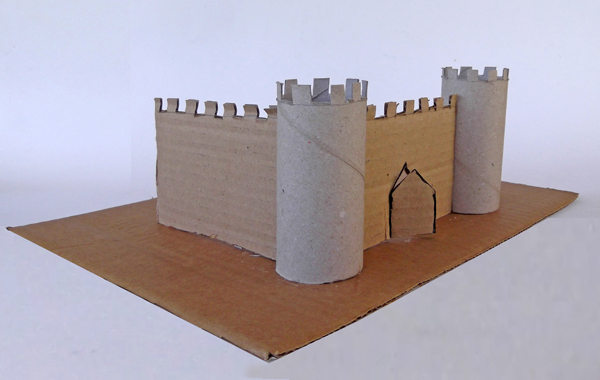 Cut out from the cardboard box a large rectangle to use it as a base for the castle. Start gluing the castle onto the base. 17. 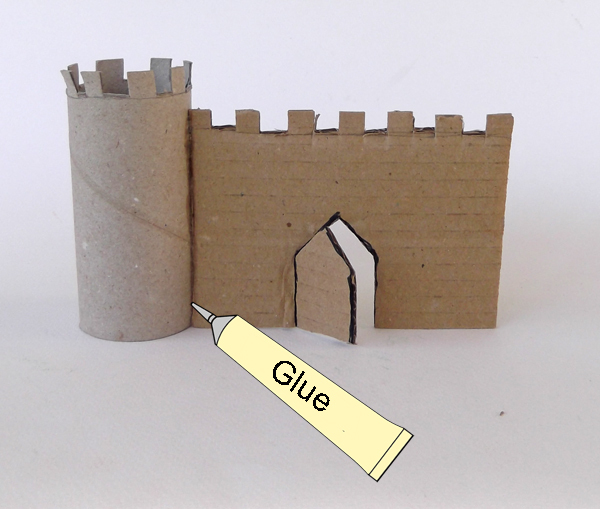 Assemble and glue the round towers and the walls together and glue them onto the base. 18. The castle should loo like this. 19. 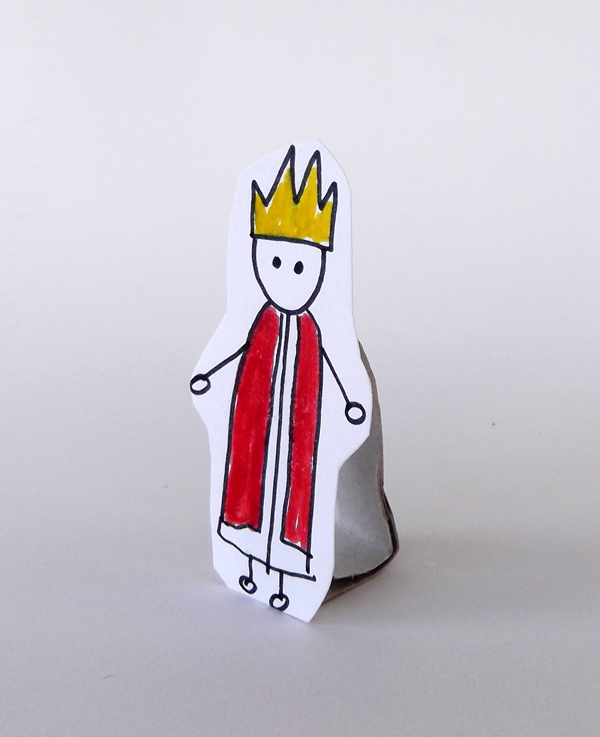 In a white paper draw a small figure of a knight or a king. With scissors cut out the figure. 20. 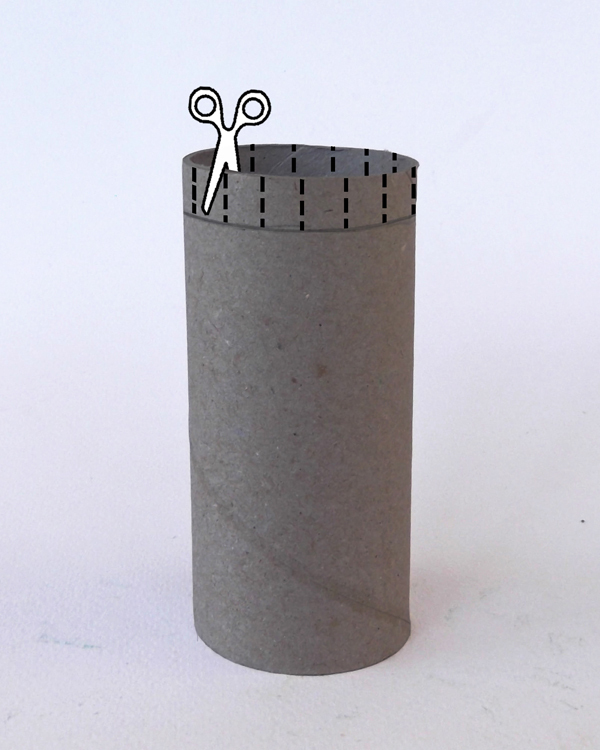 Take another paper roll and with scissors cut out a narrow ring. Fold it with your hands to give the shape of a free standing triangle. 21. 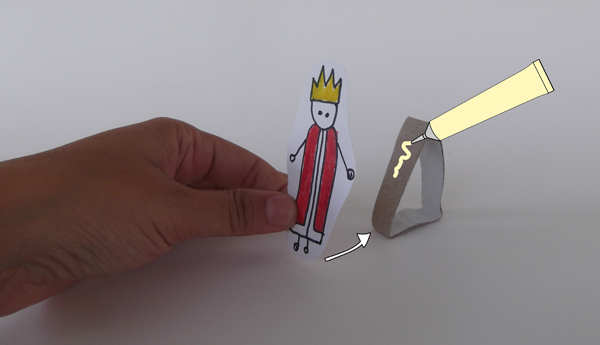 Glue the paper figure with the trιangle together. 22. 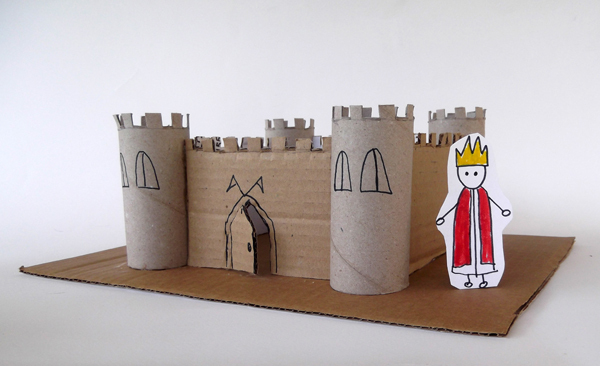 The king is ready to defende its castle. 23. 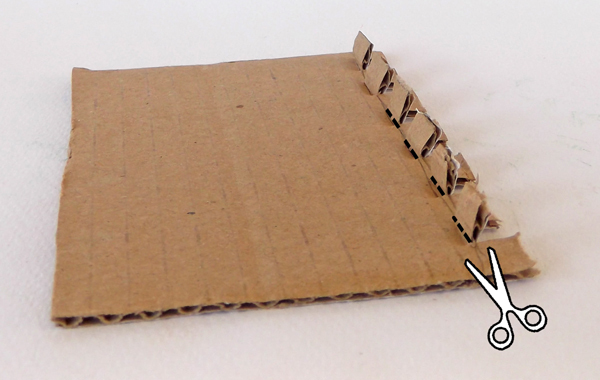 Take a small piece of colored paper and fold it in half. 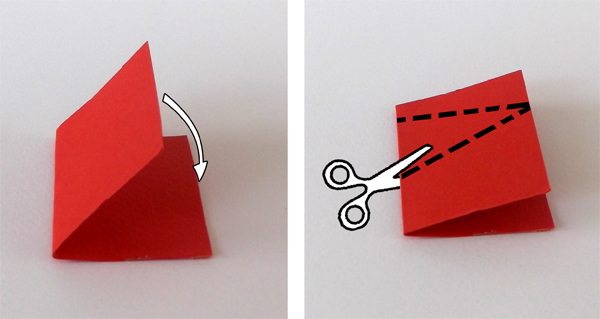 With scissors cut the folded paper shaping a triangle flag. 24. 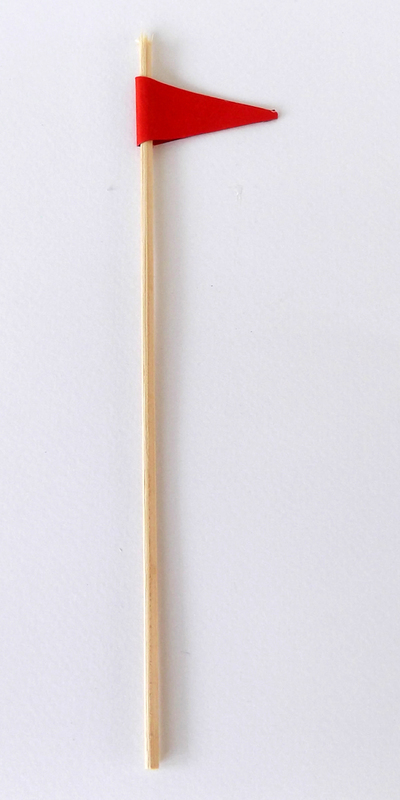 Glue a wooden stick inbetween the paper flaps. 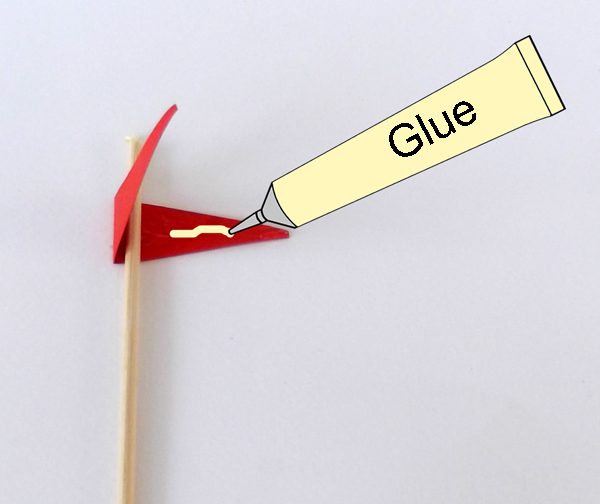 Apply more glue in the inner sides of the flag and glue them together. 25. The flag is ready to place it on the castle. Great step by step, as a beginner it was just what I needed. Excited tobtry it today!